President Kerwin to Step Down in 2017 | American University Washington D.C.
Dr. Kerwin is AU's 14th president and the first president in the university's history to also be an alumnus. American University President Neil Kerwin announced today that he plans to step down after more than a decade of leadership that transformed the institution in academic quality, campus facilities, and national standing. Kerwin informed the Board of Trustees of his decision to step down when his current contract expires in May 2017. 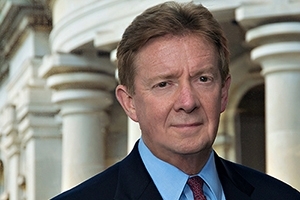 American University’s 14th president and the first alumnus to serve at its helm, he was appointed interim president in 2005, having served as professor, dean of the School of Public Affairs and Provost. In 2007 following a national search, the AU Board of Trustees appointed him president. His tenure at AU—as a student, professor, dean, provost and president—spans 42 years. Kerwin brought transparency, openness, planning and strategic thinking to an institution that was confronting governance and leadership challenges in 2005. His steadfast insistence on effective planning, shaped by wide participation and linked to resource allocation, provided a roadmap for a university that is now measurably stronger in terms of academic quality, financial position, facilities and stature. “American University, inclusive of its trustees, administrative leadership, faculty, staff, students, and alumni has been deeply engaged in a transformation exercise since 2008. The institution’s “Statement of Common Purpose” remains the same, as does its fundamental nature as a research university with a strong leaning toward the social sciences and related professional programs, and in its focus on providing a high touch, high impact experience for its students. Almost everything else about the University has changed based upon the ambitions of the leadership, a living strategic plan deeply rooted in AU’s values and realities, widespread benchmarking, the willingness of the faculty and staff to assess their programs and activities and then modify them, and a healthy dose of creativity. The demand for undergraduate admission to AU has never been greater. Today, only one in four applicants is admitted to AU. A record number of applications for Fall 2016 and rapid increases in yield rate (the percentage who accept an offer of admission) over the last two years mean that AU has become much more selective, so as not to exceed capacity for classes and residence halls. The result: an admit rate of 25.7% for freshmen applicants, a drop of almost 20 percent from just two years ago. Research and scholarship are more rigorous and intensive. The university’s research classification by the Carnegie Commission on Higher Education moved from the lowest tier among research universities to the middle tier, called “Doctoral: Higher Research Activity." The reclassification is a result of strategic decisions to expand AU’s array of doctoral programs, as well as a reflection of increased productivity in externally funded research. AU is now grouped with institutions like Dartmouth and William and Mary. Financial stability and growth are reflected in bond ratings and endowment. Ratings agencies consider a host of factors, including demand, reserves, financial statements, and debt, when they advise potential investors and creditors about the financial position of universities. AU’s rating was one of few private universities to improve during the recession and continues to be strong. Moody’s rated AU an A2 in 2005 and is A1 now. Standard & Poor’s rated AU an A in 2005 and A+ today. AU’s endowment, with careful investment and management, has grown from $272 to $550 million. The university’s transformation is changing perceptions and its reputation is growing. With intentional commitments to increase visibility and recognition, AU’s momentum is being noticed. One measure is AU’s position on the top 100 of U.S. News & World Report’s Best Colleges over the last ten years. AU is one of the fastest movers on the list, rated 87 in 2005; today it is 72. AU during Kerwin’s tenure strengthened the rigor of the academic programs at the undergraduate level and focused on improving the quality of the student experience. AU also has worked to address national higher education challenges, most notably on access and affordability, prevention and response to sexual assault and most recently, on a plan to improve diversity and inclusion. Living up to a commitment to make financial access a high priority for his tenure, AU improved affordability, radically shifting financial aid resources from merit to need based aid. In addition, AU substantially reduced average student debt by 21% over the last five years, and increased the proportion of enrolling students from low-income families. Kerwin also focused on measuring and effectively communicating AU’s return on the student’s investment and graduate outcomes. A first of its kind website, We Know Success, provides the employment and graduate school admission rates, as well as income level by degree program and major. Doubling down on commitments in the university’s mission to engage with the city of Washington and to maintain its role as a global education leader, Kerwin helped AU expand its reach nationally and internationally. He served as a member of the board of directors of the American Council on Education (ACE) (2012-15) and on the board of the National Association of Independent Colleges and Universities (NAICU) from February 2012 to February 2014. He is a member of the Greater Washington Board of Trade, and DC Chamber of Commerce; chaired the Consortium of Universities of the Washington Metropolitan Area Board of Trustees (2013-15) and was Patriot League Council of Presidents (academic years 2013-14 and 2014-15). AU’s stature and reputation have grown remarkably. In 2016, American University attracted a record number of applicants (more than 19,300) at the undergraduate level, sharply lowered admit rates to historic levels (25.7%), and expects to exceed the 2015 yield rate (32%) for students offered admission. More than half of all freshmen identify AU as their first choice. It now competes with the nation’s most elite institutions for faculty and wins its share, with recent hires from Columbia, Berkeley, Stanford, Georgetown, Northwestern, Syracuse, University of Arizona, University of Missouri, LSU and University of Glasgow. AU is growing rapidly in the sciences and the faculty is focused on finding solutions to the great issues of our time by examining emerging research topics that will be critical to the well-being of a global society in 2030. AU alumni are showing their Eagle pride by getting more involved with the university. During the last five years, alumni participation has increased 178 percent. New alumni groups and events support the university's commitments to diversity and inclusion, including Latino Alumni Alliance, Black Alumni Alliance, Pride Alumni Alliance, Women's Network and the Multicultural Alumni Reunion. AU has also benefitted from increased philanthropic efforts. Since 2005, donors have contributed more than $300 million, a third of which has been raised in the last three years. Additionally, annual gifts and pledges have nearly doubled, representing 19 percent of all funds raised since 2007. AU has secured 37 gifts of at least $1 million each from 30 unique donors. Kerwin is a noted scholar and expert on rulemaking, which made him a natural choice for the United States Senate Task Force on Federal Regulation of Higher Education. His book, Rulemaking: How Government Agencies Write Law and Make Policy is in its fifth edition. Kerwin founded the Center for the Study of Rulemaking at AU’s School of Public Affairs. For his contributions to the Washington, DC, area in higher education, economic development, and public policy, Washingtonian magazine named him a “Washingtonian of the Year” in 2009. During Kerwin’s presidency, AU has received numerous national accolades, including repeat appearances on or in the following: the President's Higher Education Community Service Honor Roll; the Peace Corps ranking of top volunteer-producing schools; and the Institute of International Education’s “Open Doors” report, which lists universities that have the greatest number of students studying abroad. AU is a top school in the nation for the percentage of students holding internships and the top producer in the nation for Boren scholars and fellows, combined. The university is regularly among the top schools in the nation for producing Presidential Management Fellow semifinalists and Fulbright Scholars. Sustainability will be another enduring legacy of his presidency. Kerwin promised carbon neutrality by 2020, the first institution of its size to commit to this date and signed the President’s Climate Commitment. In 2014, AU combined with George Washington University, the GWU Hospital to reduce their carbon footprints through a 20-year solar energy deal with Duke Energy Renewables—which will eliminate about 60,000 metric tons of carbon emissions per year—the equivalent of taking 125,000 cars off the roads. Kerwin also worked with the AU Board of Trustees to establish an investment green fund, allocating $5 million in endowment to a green investment fund. During the past 10 years, the university has championed its commitment to recruiting scholar-athletes who excel in the classroom and on the playing fields. Since spring 2005, AU scholar-athletes have held an average cumulative GPA of 3.31, well above the NCAA’s Division I eligibility requirement that a student athlete maintain a 2.0 GPA in his or her core courses. For the first time in school history, the men’s and women’s basketball teams won Patriot League Championships and earned trips to their respective NCAA tournaments. The men’s team’s first NCAA tournament appearance was in 2008, followed by repeat appearances in 2009 and 2014. The women’s team’s first NCAA tournament appearance was in 2015. During this time, AU’s field hockey, volleyball, and men’s cross country teams also earned multiple Patriot League Championships and participated in the NCAA tournaments for their programs. Twenty-three Eagles scholar-athletes were named All-Americans, with several of them earning the title numerous times during their collegiate athletic careers. Washington, DC’s NPR station WAMU 88.5 grew from a $9 million operation in 2005 to a $23 million one in 2015. During this time period, its total weekly audience (for all platforms) grew from 620,000 to more than 800,000 people; membership nearly doubled from 33,064 to nearly 60,000 donors; and membership support grew from nearly $4 million to more than $10 million. Milestones for the broadcast media outlet include its 50th anniversary in 2011; moving to a new facility at 4401 Connecticut Avenue in 2014; and Diane Rehm receiving the National Humanities Medal from President Obama—also in 2014. President Kerwin is a native of Waterbury, Connecticut. His wife, Ann Kerwin, served as a strong and important influence during his presidency, particularly in terms of her support for the Arts at AU, the library and the Arboretum. They met as students at AU and have served as one of AU’s proud alumni sweetheart couples. They are the proud parents of two adult sons, one of whom followed in his parents' footsteps and is also an AU alumnus.